The free online courses offered by the Massachusetts Institute of Technology (MIT) are getting more than a million hits a month, an example of the burgeoning interest in internet education. Including translations on MIT’s OpenCourseWare (OCW) site, the total rises to about 1.5 million hits. Math professor Gilbert Strang’s 18.06 linear algebra course (using and understanding matrices) is the most often downloaded, MIT’s website said; users view his lectures about 200,000 times a month. I love this story for two reasons. First, as a creator of a couple of online courses with many more in the pipeline (hockey and Canadian literature is next on the agenda), I’m excited about how all these developments are going to transform education. 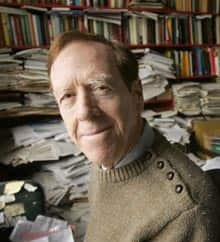 Second, I just had to include the photo of Professor Strang to point out how much tidier my office is compared to his. I feel much better now. Back to work! wow, i hadn’t heard of this. thank you.